An influence album of timeless songs and a few new ones, REAL country music at it's finest! The Mid-West’s Pete Schlegel is the story of a farm boy's dream come true. Raised on a Paulding, Ohio dairy farm, Pete listened to country radio shows while milking the cows. As a fourth grader, he received a guitar from his dad. That simple gift a long time ago would become Schlegel’s passion and livelihood. Pete had always participated in school choirs, musicals, and the local karaoke circuit, but it was prompting from family and friends that enticed Schlegel to start a band. 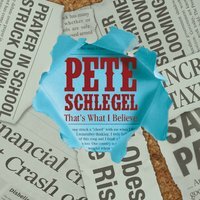 With his popularity on the rise and the riggers of touring, Pete would have to choose between his normal life as an ex-Ohio State Trooper and EMS helicopter pilot, and his childhood dream. Pete left the family farm in March 2002 and Pete headed to Nashville, where he began working with producer Clyde Brooks. Brooks produced Pete's debut album "Strong Stuff". A total of three nationally charted singles were released from "Strong Stuff". The singles "Short For Gone", "Leavin' Ain't As Easy As It Sounds" and "It Takes A Whole Lot Of Liquor To Like Her" have exposed Pete to a wider audience in the United States as well as Europe. "Leavin' Ain't As Easy As It Sounds" dominated the international chart for over seven weeks and became the Number 1 single in Germany. The "It Takes A Whole Lot Of Liquor To Like Her" video was chosen as a Hot Pick Video on Great American Country (GAC) television and received substantial video spins on VH1 Country. Pete completed his sophomore album "I'm Not Listening" under the direction of Nashville producer Ted Hewitt in January. The first single "Alcohol Abuse" was released mid summer of 2006. His last single and video, "You Can't Bring Her Back" was released in 2008. The videos for "Alcohol Abuse" "It Takes A Whole Lotta Liqour To Like Her" and "You Can't Bring Her Back" can still be seen on GAC and CMT. After three years of extensive touring in 2005, 2006, 2007 with Daryle Singletary and Jeff Carson, Pete came off the road in 2008 to operate his family farm and family owned businesses. After a four year break from heavy touring, Pete has reunited with some of his long term band mates and has kicked off the "Hitting The Honky Tonks" and "Keeping It Country " tour for 2014. He has started working on his 4th studio album to be released in late April of 2014. His new album produced by Grammy nominated Nashville producer Greg Cole will feature 11 cuts. Pete has chosen some of his all time favorite "true" country music songs in addition to some new material for radio release and for his "Tru Fans". Listen and request Pete on your favorite radio station and see Pete at a city near you in 2014!